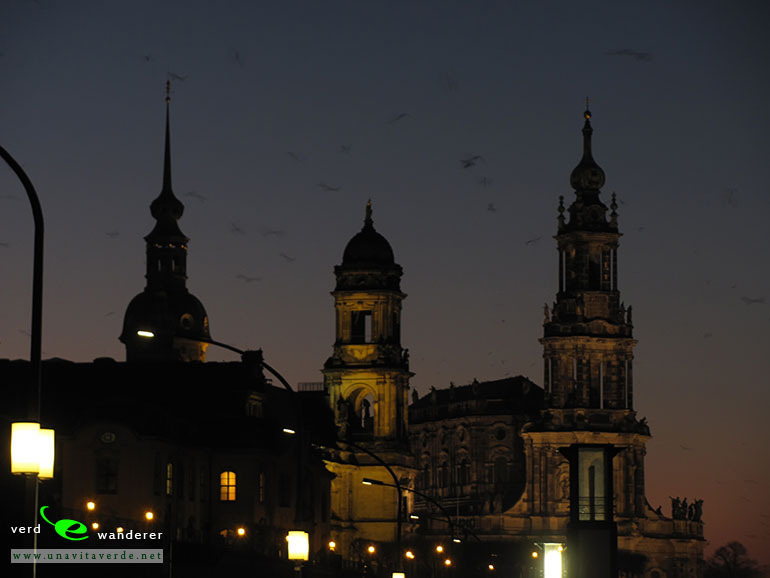 Dresden carries visitors away with a synthesis of the arts: fascinating buildings and art treasures, impressive museums, as well as orchestras and choirs of worldwide reputation. 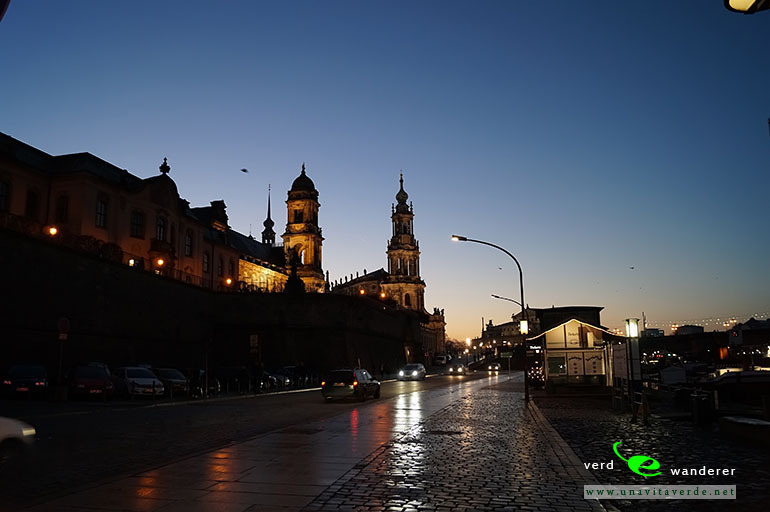 Dresden offers attractions in great variety and combines three aspects which complement one another: notable art treasure, architectural sights and a charming landscape. 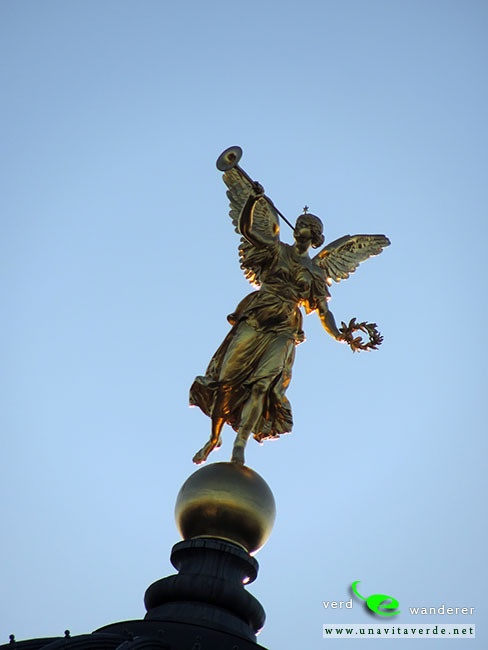 During the last months of World War II, residents expressed the desire to rebuild the church. 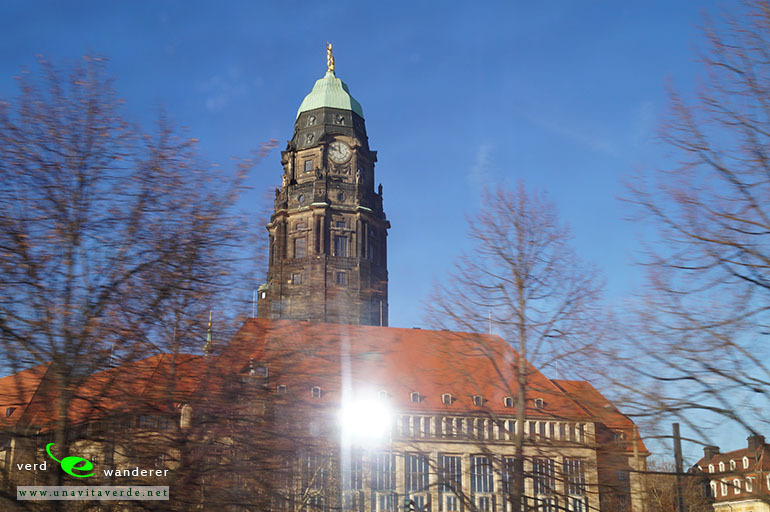 However, due to political circumstances in the GDR, the reconstruction came to a halt. 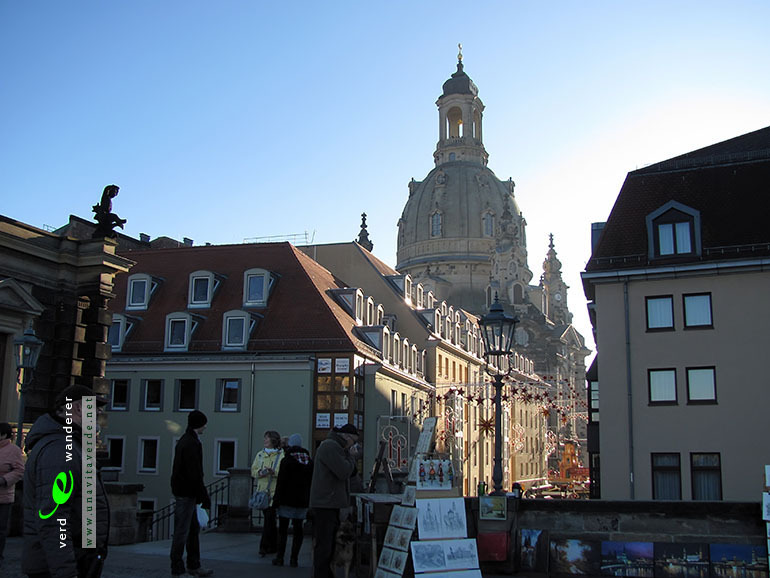 The heap of ruins was conserved as a war memorial within the inner city of Dresden, as a direct counterpart to the ruins of Coventry Cathedral, which by German bombing destroyed in 1940 and also serves as a war memorial in the United Kingdom. 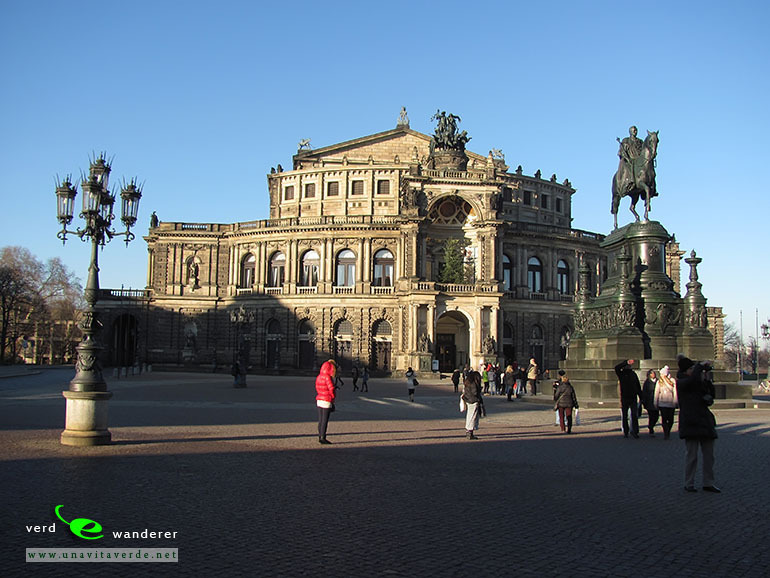 Because of the continuing decay of the ruins, Dresden leaders decided in 1985 (after the Semperoper was finally finished) to rebuild the Church of Our Lady after the completion of the reconstruction of the Dresden castle. 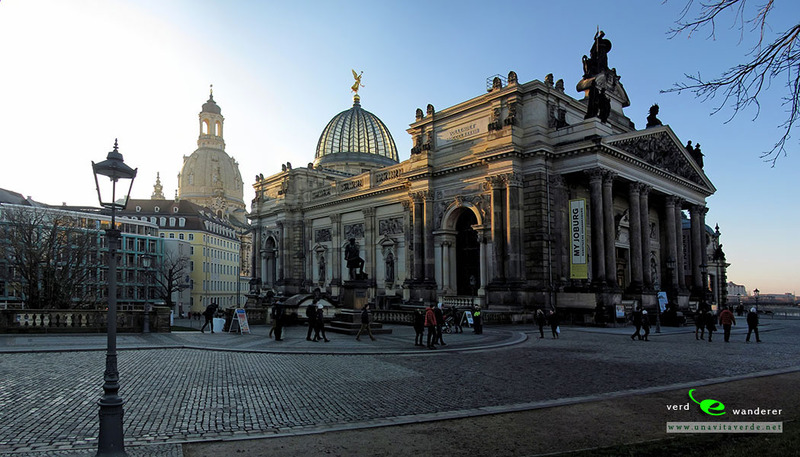 The reunification of Germany, brought new life to the reconstruction plans. 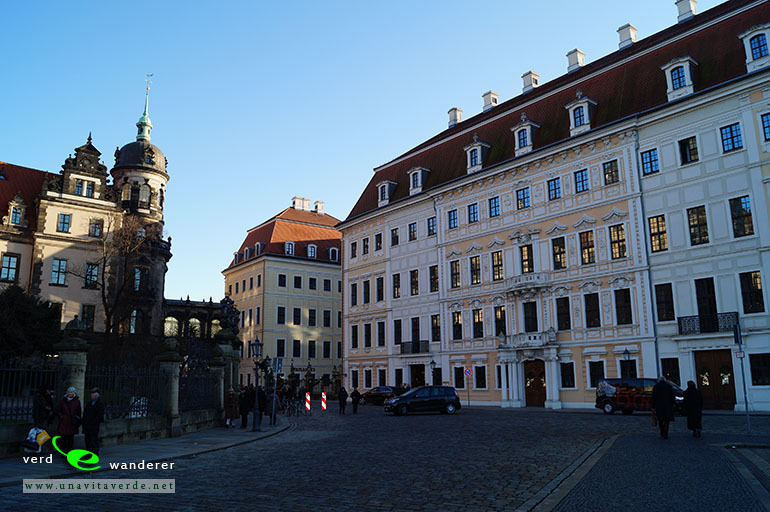 In 1989, a 14-member group of enthusiasts headed by Ludwig Güttler, a noted Dresden musician, formed a Citizens’ Initiative. From that group emerged a year later The Society to Promote the Reconstruction of the Church of Our Lady, which began an aggressive private fund-raising campaign. 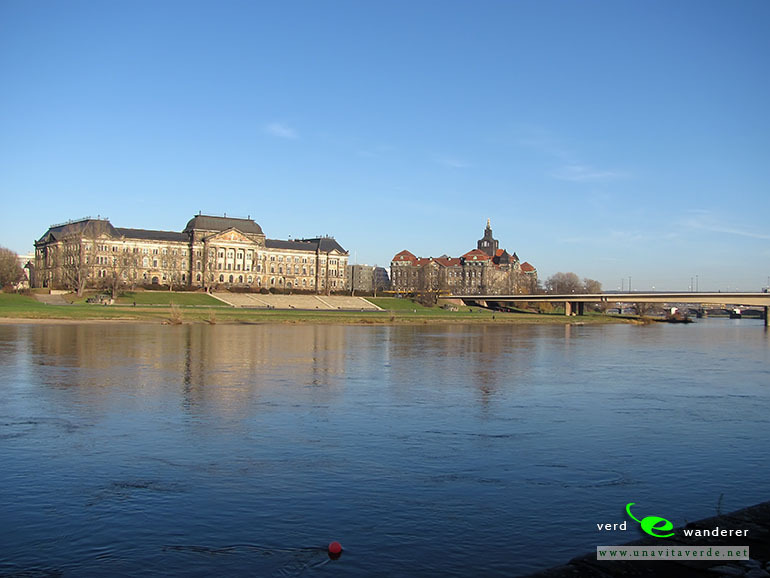 The organisation grew to over 5,000 members in Germany and 20 other countries. The project gathered momentum. As hundreds of architects, art historians and engineers sorted the thousands of stones, identifying and labeling each for reuse in the new structure, others worked to raise money. 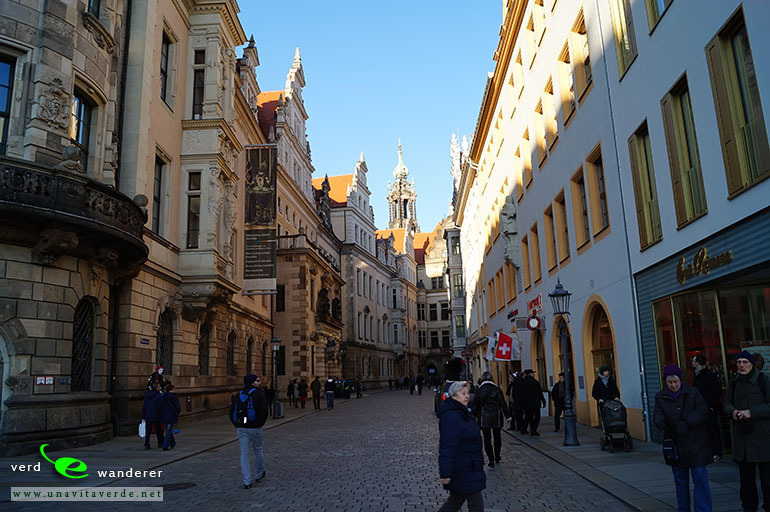 After all, the historic city center was rebuilt. 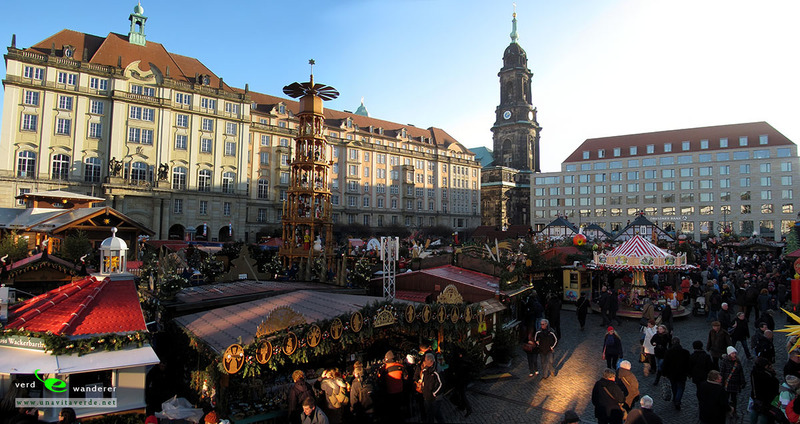 The Striezelmarkt in Dresden is one of Germany’s oldest documented Christmas markets. The annual market celebrated its 578th anniversary in 2012. 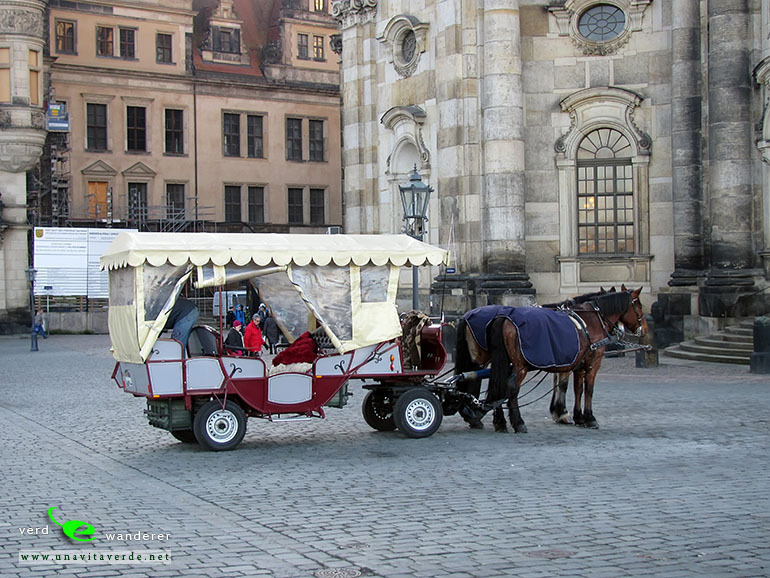 It was first mentioned in 1434, under Friedrich II, an Elector of Saxony, when it was held the Monday before Christmas on the Altmarkt square. 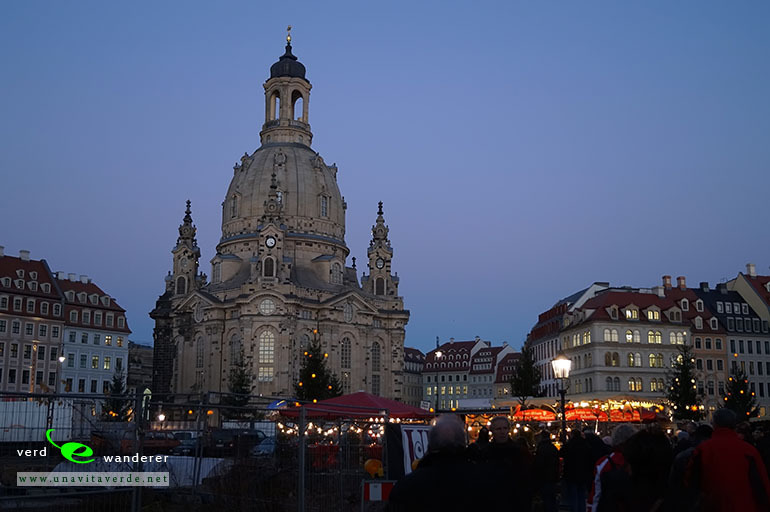 Over the centuries it has developed into a huge event with 250 stands, taking up a large part of Dresden city centre and lasting throughout the Advent period. 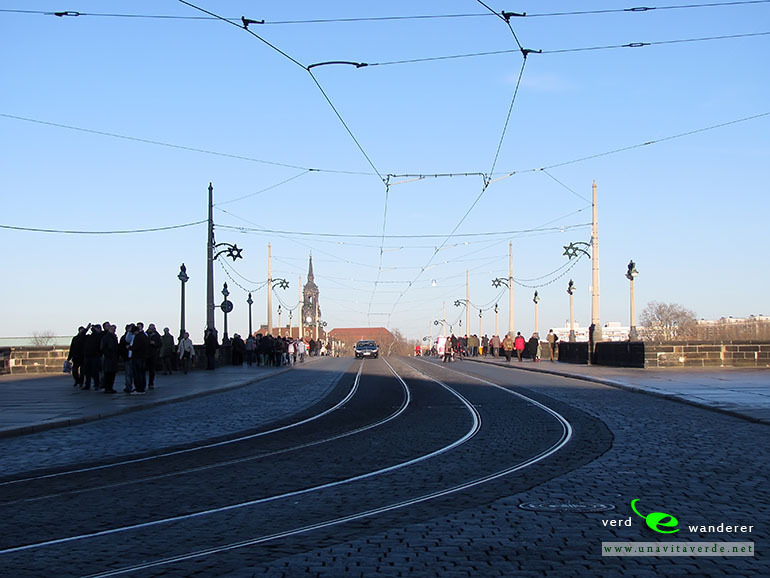 Today the Striezelmarkt attracts 2 million visitors a year from all over the world. 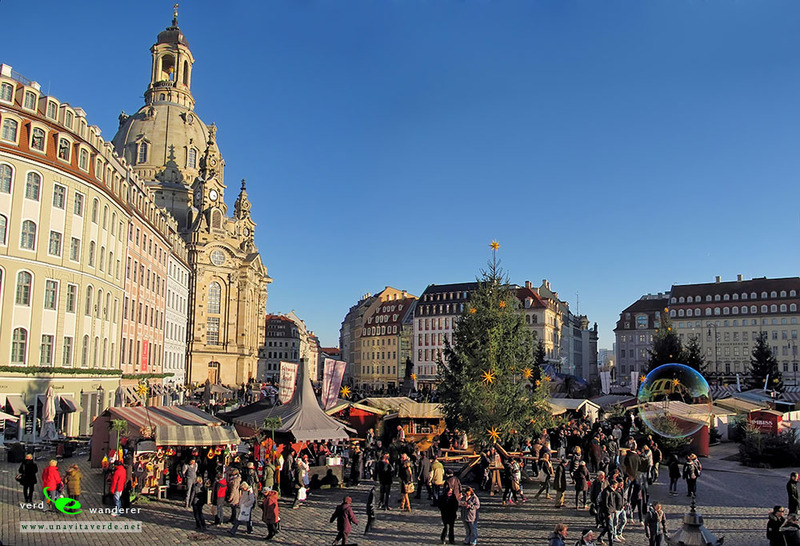 ABCnews featured Dresden market as having the most authentic holiday market experience in Europe. 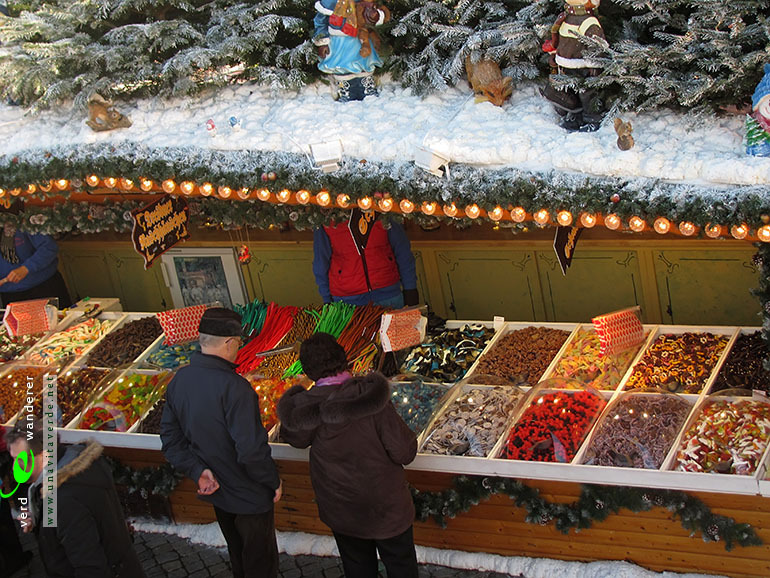 The word Striezelmarkt comes from Strüzel or Stroczel, which was the name of a type of cake sold at the market, now famous as Stollen or Christstollen. Stollen is a light airy fruitcake which is quite low in sugar, today available in many parts of the world. 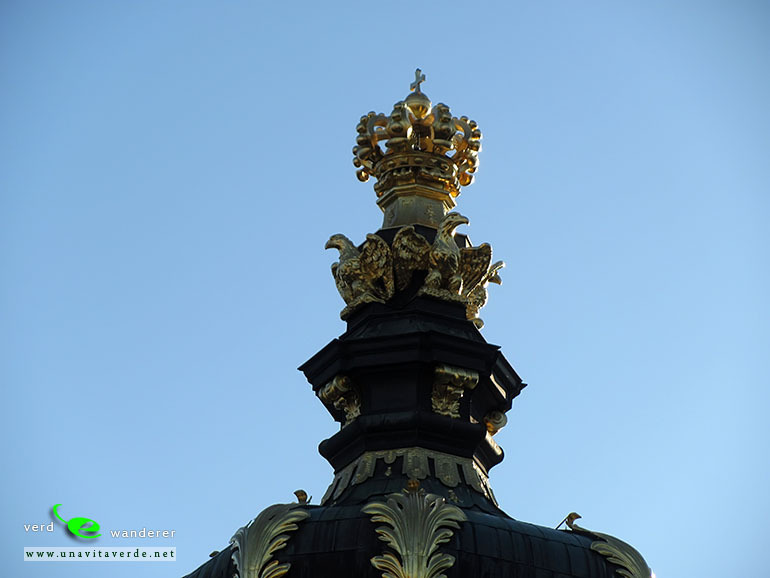 The true Dresden Stollen, however, is produced in the city and distinguished by a special seal depicting the city’s famous king, August the Strong. The shape of the cake is meant to be reminiscent of the entrance to a mine tunnel (the literal meaning of Stollen) reflecting the area’s silver and tin mining history. 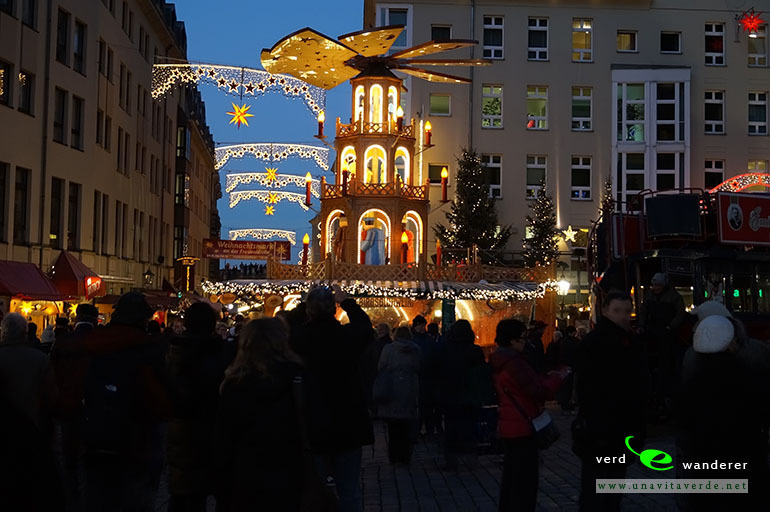 At the centre of the Striezelmarkt stands a 20m high spruce, brought from the nearby Tharandt woods and decorated with lights. 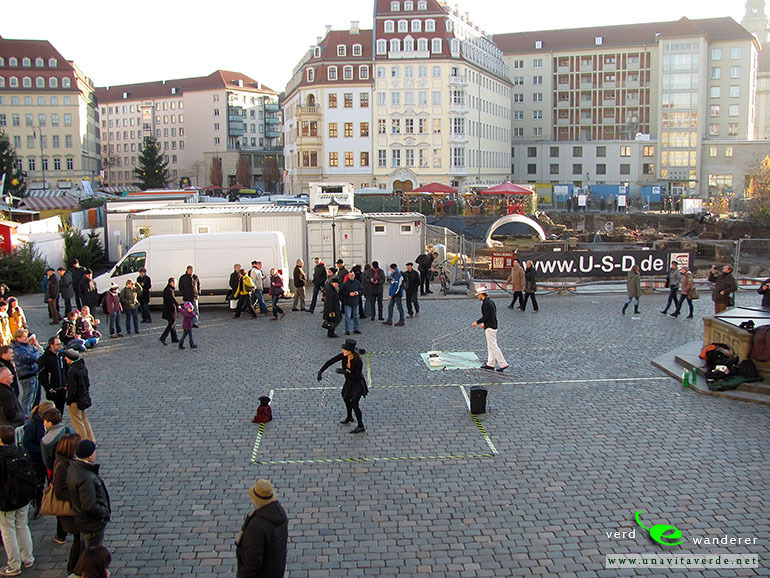 At the back of the market square there is a painted wooden fairy-tale castle which is also a giant Advent calendar. A door is opened every day by children’s entertainers, with a puppet show, and on Fridays there is a visit by Father Christmas himself. 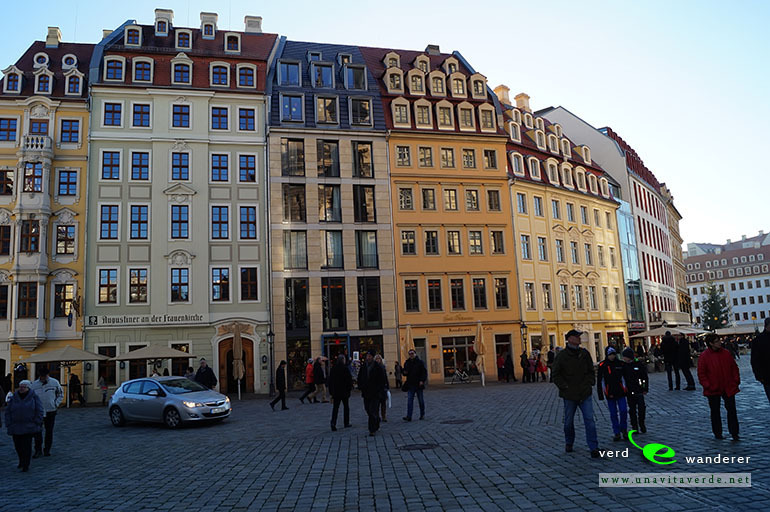 See photos of Dresden (including historic centre, Zwinger Palace, the Elbe river, the Semperoper, view over Altmarkt during Striezelmarkt, Dresden Academy of Fine Arts), in this travel photo gallery from Verde Wanderer. 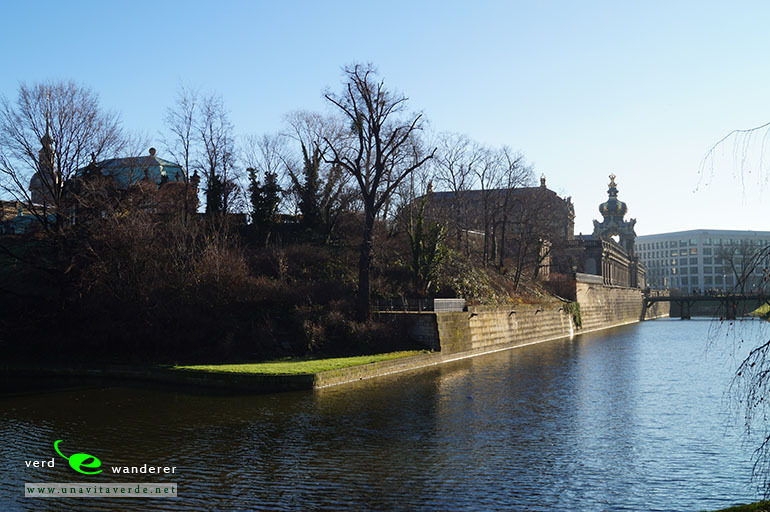 Pictures taken at 13 of December, 2013.